The d- day approach, invitations are send, the dress is chosen, the celebration is gradually organized ... But what about the hair? Your guests will admire you because you are the star of this big event. Nothing should be left to chance to make this day a perfect day. And it all starts with you! The bride! Once you have chosen your dress, the hairstyle can be imagined all in harmony to magnify the dress of your dreams. 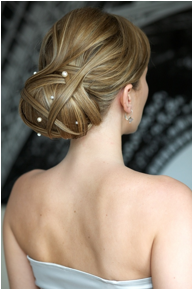 Having the perfect hair is holding all the chance on your side to make your wedding day, the happiest of your life. 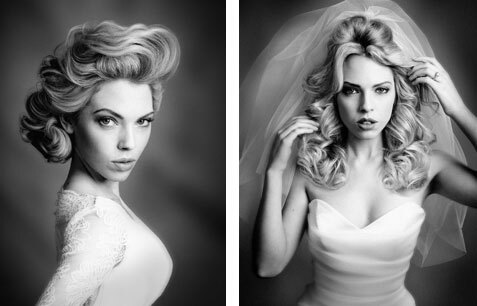 To enlighten you in this crucial choice, Collection Hair offers a panorama of the most beautiful bridal hairstyles. Wide and voluptuous Dessange has perfectly mastered this lovely hair up. 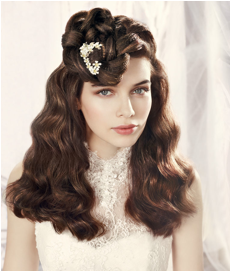 Revlon unveils a romantic hairstyle wish these silky waves. 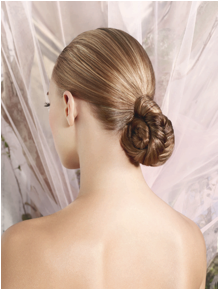 This low bun surrounded by a braid gives a sensation of delightful symphony by Michel Dervyn . A beautiful volume surrounded by a maxi headband, Carita initiates us into seduction. 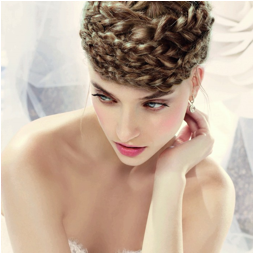 Franck Provost knots and braids an asymmetric hairstyle. The country style is very well executed ! Very Hollywood, these loops up or down will pleased all the Divas by Martin Crean . 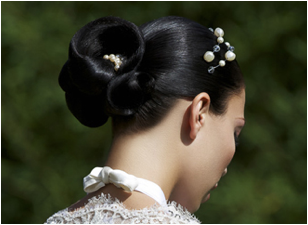 Very elegant and characterial, this high fashion updo by Intercoiffure promises to conquer the soul mate. Revlon creates a refined style to highlight a beautiful uncover back. By this soft pompadour hairstyle ending with lovely curls, the Haute Coiffure Française insures the glamour. 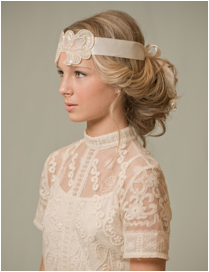 A pearl headband adorns this free hairstyle, L'Oréal has chosen a natural hairstyle. Coiffirst amplifies smooth movements and graceful volume, romantics will be delighted. This bun is in perfect harmony with a posh and stylish dress signed by Saint Algue . A smooth and shiny hair highlighted by pearls, Christine Margossian goes for a sweet oriental fragrance. Carita rethinks a classic with big grey pearls that look futuristic. 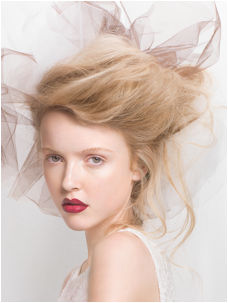 All on the side, Franck Provost creates an informal style for a pretty bride. As she is about to experience the most beautiful day of her life, she grabs the very trendy braided crown done by Revlon . L'Oréal creates a smooth and shiny hairstyle with lovely ornament. Rockabilly hair, Intercoiffure plays with strands to give them dynamism and originality. This bun would suit girls who like sobriety and elegance, a fine work by Maë Haute Coiffure . Nathalie Calderini captivates us with these free and seductive curves, a vintage version underlined by a gorgeous headband. Dreams of a splendid wedding where everything shines? 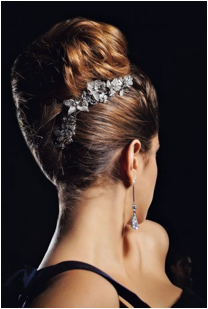 Murielle Palace offers this beautiful updo adorned with sparkling jewels. It may recall the retro years, but it's rather modernized by Matrix . A modern and messy styling that Lothmann creates cheerfully. A crazy look to say: "Yes "!